Two years ago we had a Little House birthday party for my daughter's 6th birthday. I blogged about it at This Simple Home back then, but I thought it'd be very appropriate to write about the Little House party on this blog. It is much cuter in person. I created the invitation in Microsoft Word using their art borders. 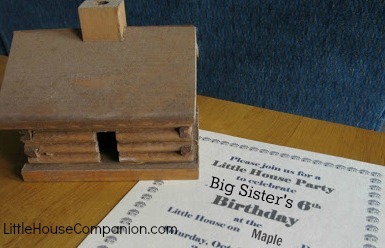 They have a little house, and by changing the color of the house to brown, it looks a bit like a cabin. Go to PAGE LAYOUT -->> BORDERS -->> ART BORDERS -->> Choose the little houses -->> Choose brown for the color. 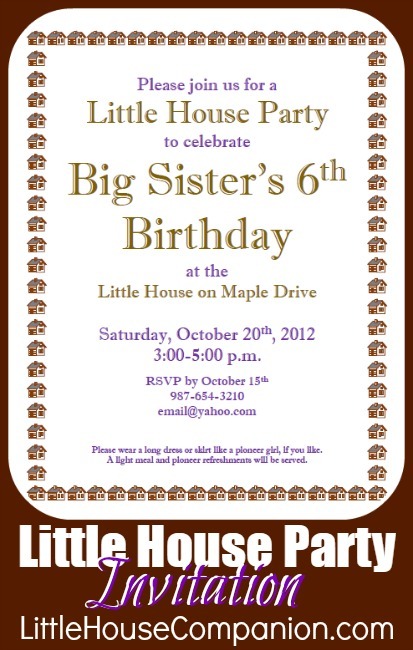 "Please join us for a Little House Party to celebrate Big Sister's 6th Birthday at the Little House on Maple Drive Saturday, October 20th, 2012 3:00-5:00 p.m. RSVP by October 15th 987-654-3210 email@yahoo.com Please wear a long dress or skirt like a pioneer girl, if you like. A light meal and pioneer refreshments will be served." You'll notice (I hope) I did not use proper punctuation in the invitation, except at the bottom where I used proper sentences. The text font shown above is Imprint MT Shadow. The cuteness factor increases when this is printed on tan cardstock. I printed two to a page, so they would be of "normal" invitation size. I did not include our house number since those who will be invited know where we live, but I did use our road name for the "Little House on Maple Drive." For fun, I included, "Please wear a long dress or skirt like a pioneer girl if you like!" The party ended at 5 p.m. I wanted to be clear that pioneer food, but not a large meal, would be served. Then there is no doubt! Brown and purple text was used for the invitation. Here is what the actual invitation looked like. You'll see it was actually a different font that I used then. You might be interested in our other Little House Party Ideas. More are coming soon! More Little House party details coming soon!